This is the second newsletter of the Friends of our new "transformed" institution, Library and Archives Canada. And it is the second opportunity for me, as President of the Friends of LAC, to extend greetings to all of you as we move forward in the program of this fine organization. The greatest event of our year is undoubtedly the book sale, and the 10th anniversary sale held in October 2004 certainly lived up to the Friends' standard. I was delighted to join with Marianne, Grete and Ian in cutting the cake! I want to extend sincere thanks to all the volunteers who made this sale possible. You spent countless hours sorting and pricing the books, setting up the tables at Carlingwood, and then doing the actual selling. Your contribution of your precious time is greatly appreciated, and has enabled us to bring in an impressive sum of money to aid Library and Archives Canada in purchasing special acquisitions. Our most recent Antiquarian Book Auction (April 2005), like its predecessors, was a great success. I want to express thanks also to all the volunteers working on this. And to those Friends who are not able to participate in either of these events, I thank you for your membership and the financial support that this represents. Finally, I would like to wish you all good health and happy times in what is still a "new" year. You may recall that in the Spring 2004 issue of A Note Among Friends, Roch Carrier and I wrote about the "grand transformation journey" on which the National Archives and the National Library were embarking. Much has happened since that time. On May 21, 2004, the Library and Archives of Canada Act was proclaimed and we officially became Library and Archives Canada (LAC). 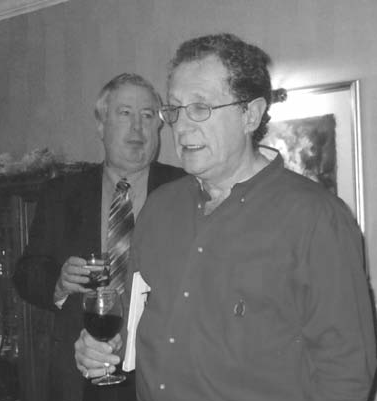 All of us greatly appreciated the role of the Friends in helping organize the staff farewell event, thanking Roch Carrier for his extensive contribution as National Librarian from 1999 to 2004. Our new integrated organizational structure was put in place on June 21, 2004, and in September, I was formally appointed Librarian and Archivist of Canada. These very visible milestones in our journey are important; of equal importance, however, is all of the work that is currently taking place at LAC as we give life to our new institution, with new ways of doing things, new objectives, and a new vision so that we meet the evolving information and learning needs of Canadians, wherever they live. Our transformation process is about potential - the potential of LAC employees to become engaged, work creatively, and move forward with confidence and a spirit of collaboration. Our transformation process is also about possibility. We want to continue to develop and work with library and archival communities in Canada, and our other partners and stakeholders, to build a strong, cohesive national documentary heritage collection, and to make it known through collective actions. We also want to make LAC an important learning destination, helping to foster a nation of learners by making it easier for Canadians to better understand our country's heritage, knowledge and culture. These are exciting times for us as we continue our transformation into a new kind of knowledge institution, and we are pleased to have our Friends as partners on this journey. 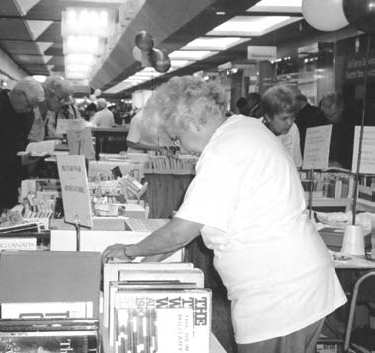 Above Left: Opening of the Book Sale. 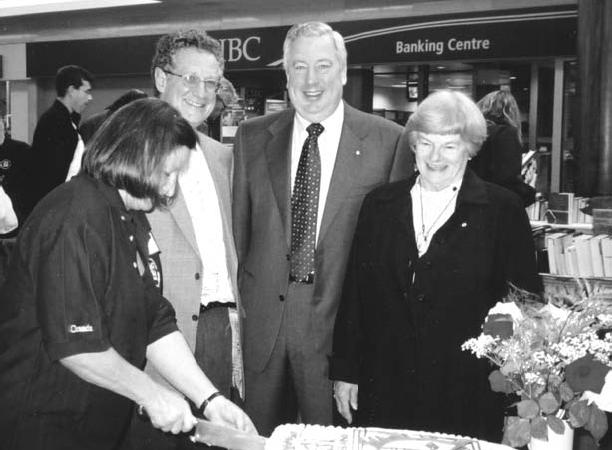 From left to right: Francine Levesque, chair of the sale; Ron Cohen, president of the Friends; Ian Wilson, Librarian and Archivist of Canada; Marianne Scott, former National Librarian of Canada. Above Right: Past presidents Gail Baird (left) and Grete Hale make everyone feel welcome. 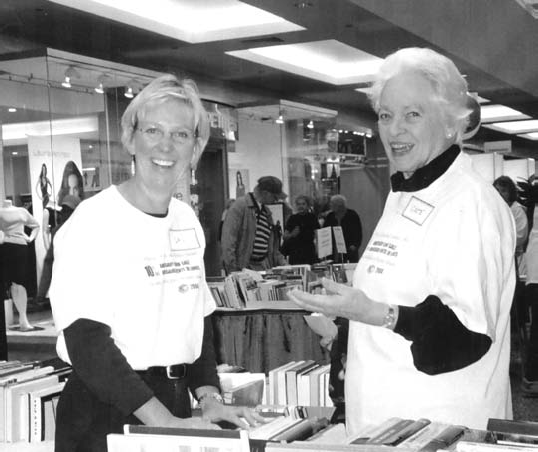 The annual Used Book Sale of the Friends was held at Carlingwood Shopping Centre, Ottawa, October 1 to 3, 2004. This was the tenth sale, and the anniversary was marked with a brief ceremony and a cake. Taking part in the festivities were the Librarian and Archivist of Canada, Ian Wilson, Friends' president Ron Cohen, former National Librarian Marianne Scott, and the Friends' first president, Grete Hale. As usual, the book sale occupied a large section of the shopping centre. Organizing the event, sorting the huge numbers of books beforehand, and selling at the event, 115 volunteers worked a total of 2,100 hours. 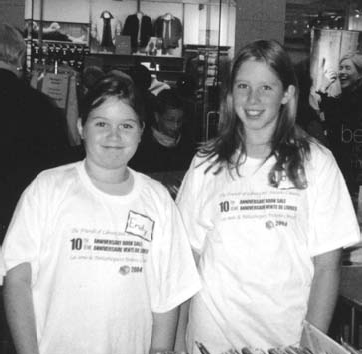 At the sale, volunteers sported new T-shirts, featuring the new name of the institution-Library and Archives Canada. Hundreds of purchasers, some devotees of the sale and some interested passersby, delighted in searching through the many wonderful publications. Total revenues from the sale were $33,798.00. Plans for the 2005 book sale are already underway. We have a new sorting and packing area located in the Personnel Records Centre, 18 Goldenrod Street, in Tunney's Pasture. The phone number is 946-8688. Volunteer sorters are usually there on Tuesdays from 9:30 a.m. to 2:00 p.m. Anyone wishing to drop off books during the week should go to the loading dock located at the rear of the PRC building and ring the buzzer. The commissioner will give directions to the drop-off container. Above Left: Granddaughters of two of our long-time volunteers, Emily Eckford (left) and Jane Roberts, sell books at the Children's Literature Section. Above Right: Steffanie Eckford (left) and Bev Theros help a client. Myra Clowes, a long-time volunteer, keeps her table stocked and tidy. 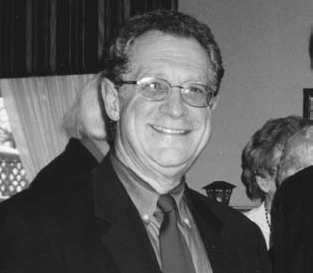 Above Left: Ron Cohen, president of the Friends welcomes members to the Annual General Meeting which was held June 22, 2004. 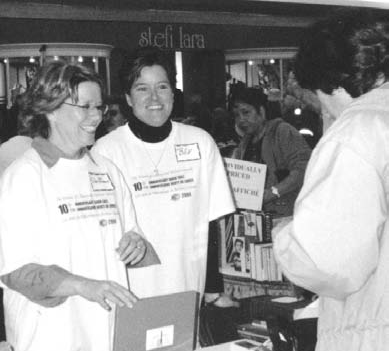 Above Right: Helen Gillespie, a member of the staff of LAC, volunteered her free time throughout the book sale to help the Friends. 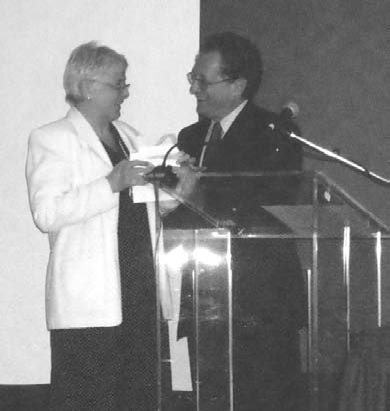 Here Ron Cohen presents Helen with a volunteer-ofthe-year award for her hard work and dedication. A visit to the Diefenbunker in Carp, about 20 kilometres west of Ottawa, gave Friends a glimpse back into the Cold War era. The bunker was built between 1959 and 1961 to house top officials of government and the military in the event of nuclear attack. It consists of four stories underground, a total of 100,000 square feet in extent. It was a highly secret government facility for many years, but is now open to the public, as Canada's Cold War Museum. During their visit on April 17, 2004, Friends were able to tour the entire site, including the Prime Minister's suite, War Cabinet room, mini hospital, decontamination rooms, Bank of Canada vault, and CBC Radio studio. The bunker was designed to house as many as 500 people for a month. Think of being huddled underground for a month, seeing no daylight, and knowing that a terrible disaster had happened just outside! We can all feel very glad this did not happen. But it was very interesting to see this site and to be reminded of this part of our history. We then had a delicious lunch at The Swan in Carp. On the homeward journey, we stopped at a maple-sugar house, where we were able to purchase some tasty products. Altogether it was a very enjoyable day. Many thanks to organizers Jay Atherton, Kathleen Shaw, and other members of the Program Committee. It looked like a table from culinary heaven. 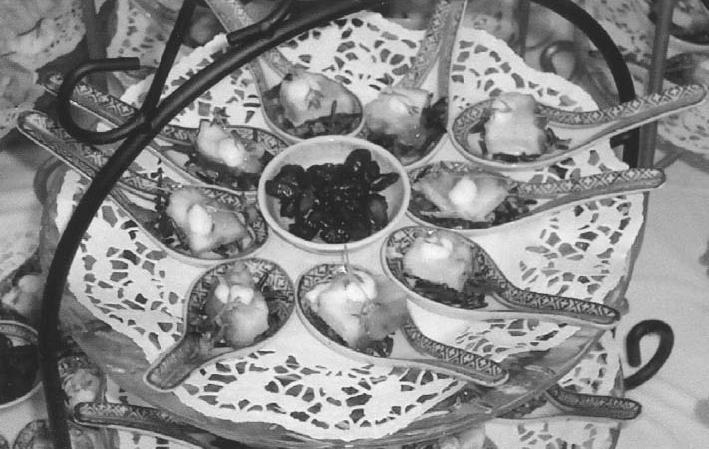 A marvellous display of hors d'oeuvres greeted Friends at an evening with Margaret Dickenson on December 1, 2004. Margaret Dickenson is a graduate in food and nutrition from the University of Guelph, and has perfected her skills during 30 years as a diplomatic wife. Her husband, Larry, who was with her at the Friends' event, has been Canada's ambassador to a number of countries. Margaret has done a TV series and has written a book, From the Ambassador's Table, giving suggestions for elegant entertaining. 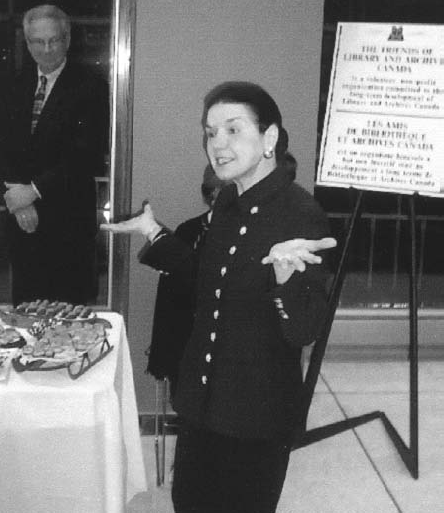 During her talk, Margaret offered tips on how to prepare attractive and delicious canapes "without much work." For example, she demonstrated the preparation of a salmon sachet, which consists of a small crêpe filled with smoked salmon. The edges of the crepe are then tied with a strand of thyme to make a little sachet. For a large party, it would be necessary, of course, to make dozens of these. This might be easy for Margaret Dickenson; most of us would need some practice! But the results of her efforts were wonderful. Friends greatly enjoyed sampling her attractive and tasty treats. Organizers Jay Atherton and Asalyn and Donald Meakin served at the bar. Copies of Mrs. Dickenson's book and video were available for sale. This was an evening we will remember for a long time. 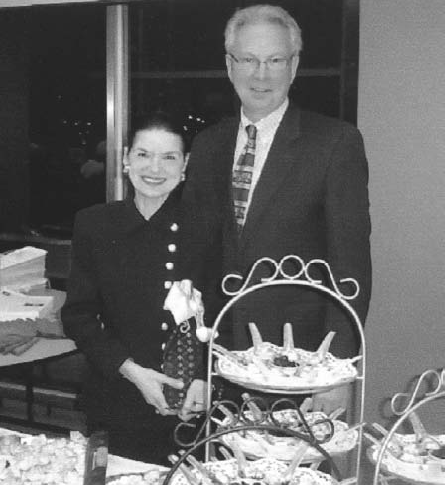 For several years, the president of the Friends, Ron Cohen, and his wife, Wendy, have hosted an annual Volunteers Appreciation Tea, to thank the many volunteers on whose work the Friends depend. This year the event was held on December 12, 2004. The Cohens have a beautiful home in Manotick, and the party was, as always, marvellous. Guests of honour included the Librarian and Archivist of Canada, Ian Wilson, and former National Librarian Marianne Scott. 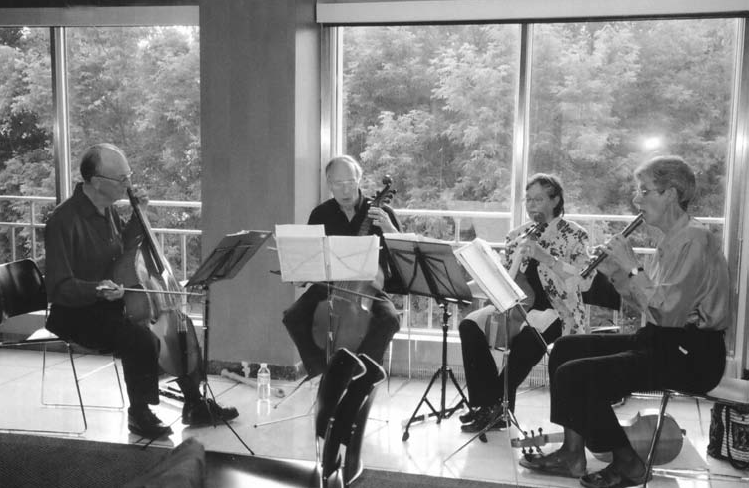 The Friends extend sincere thanks to Ron and Wendy Cohen for a wonderful party. What a beautiful table! Volunteers, left to right: Daphne McCree, Regina Forester and Eva Zadarnowski. 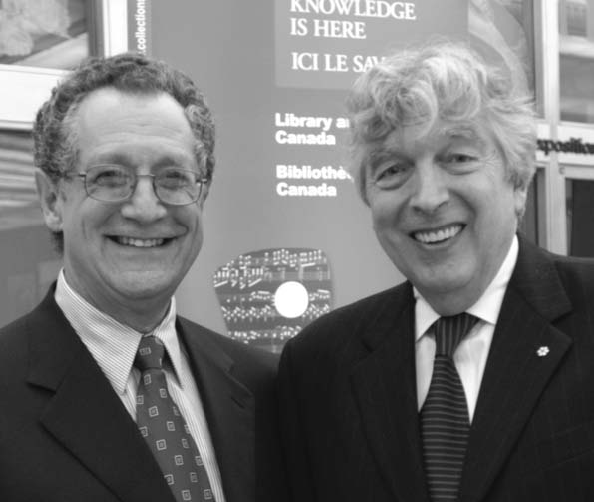 Ian Wilson (left), Librarian and Archivist of Canada, and Ron Cohen, president of the Friends and host of the event, thank the volunteers for their support throughout the year. 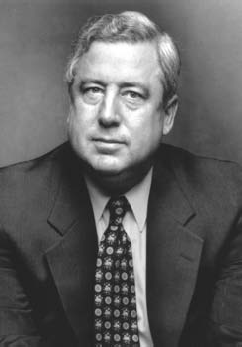 Following the transformation of the National Library and the National Archives into a single new institution, Roch Carrier retired from his post as National Librarian of Canada. Mr. Carrier is probably most famous for his classic work, The Hockey Sweater, a representation of which appears on the Canadian five-dollar bill. During his years as head of the National Library, he served this institution very well, and we greatly regretted his departure. 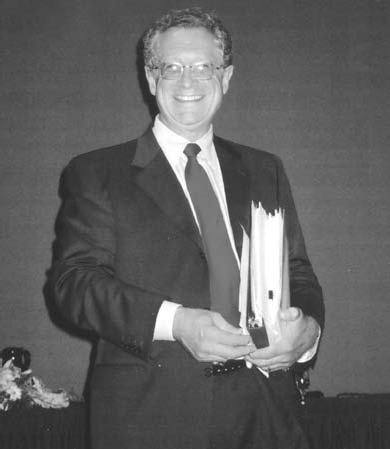 At a ceremony on May 26, 2004, Friends' president Ron Cohen presented him with a book, Élégies pour l'épouse en-allée: poèmes, by Alfred Desrochers, a gift from National Library staff and the Friends. It is a pleasure and an honour for me to serve as editor of the newsletter of our new organization, the Friends of Library and Archives Canada. We hope this publication will be a useful outreach vehicle and a way to keep all Friends in touch with the organization. I would be pleased to receive letters to the editor, comments and suggestions.